Ever wondered what propeller or what motor performs best for your needs? 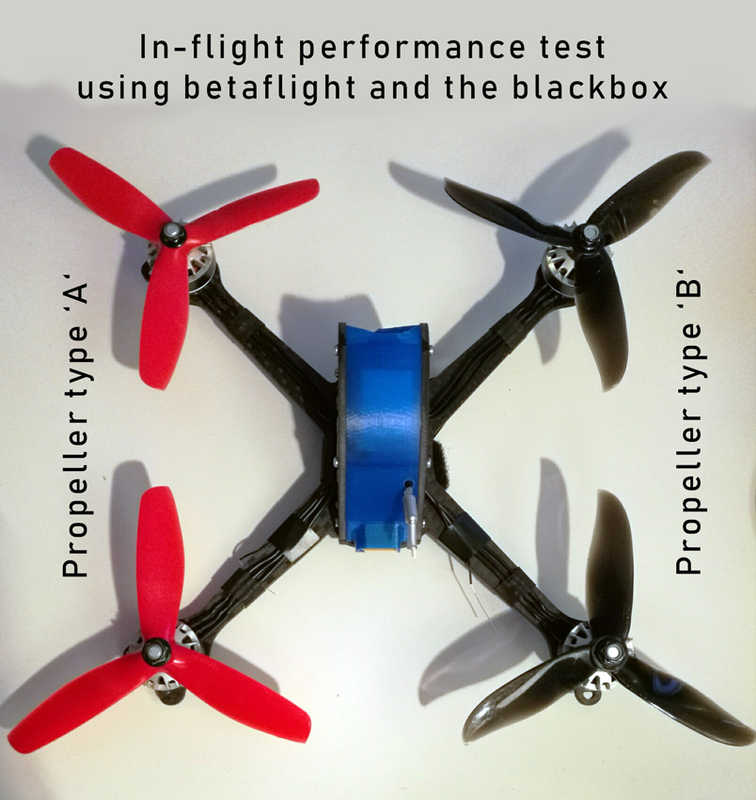 Here is a simple way to determine the performance of different propellers (or motors) directly in flight, using your multirotor, the blackbox and some math. In the past, a lot of static thrust tests have been done to determine the current, thrust and efficiency of multirotor propulsion systems. However, they don't tell you anything about the propeller or motor performance in fast forward flight. Aerodynamics in forward flight and with a non-uniform inflow of the air are very different from static measurements. What propeller will reach the higher top speed? 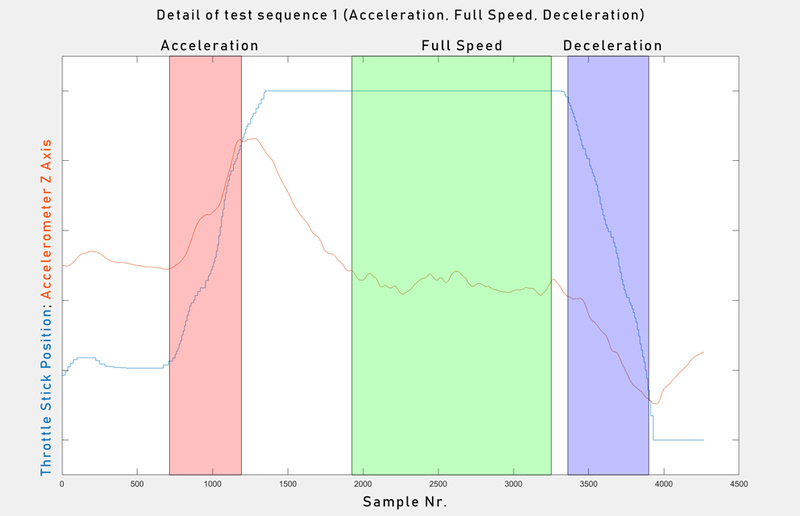 And which one decelerates better when throttle is cut? My idea was to mount one kind of propellers on the left side of the multirotor, and another kind of propellers on the right side. These propellers should then be compared directly in flight. I used one of my 6 inch rigs with T2 2206 2300 kV motors (well, not the most recent stuff, but still pretty ok), and Tattu R-Line 1550 mAh 4S. 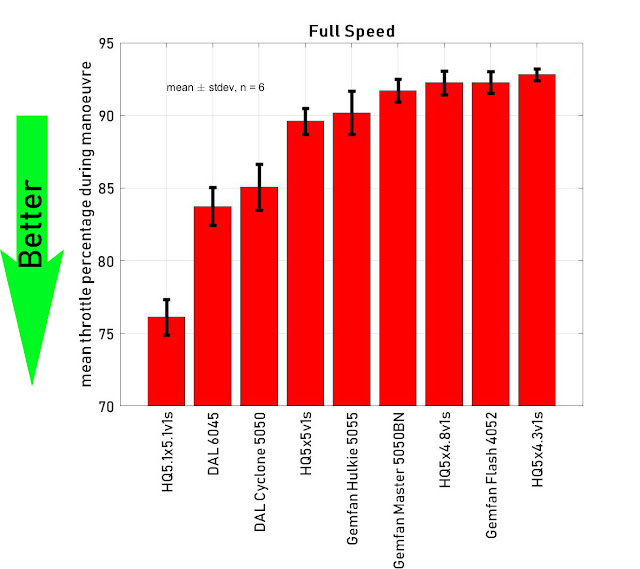 This kind of relative comparison technique will eliminate disturbances caused by wind, battery performance of different packs, or even piloting error. It is a relative measure with no absolute meaning, but it allows to generate a relative ranking system of the propeller performance. The flight controller will have a lot to do during these manoeuvres, as it will try to keep the flight path straight all the time. Surprisingly, it manages to do it perfectly: With a properly tuned system, you can't actually feel any influence. 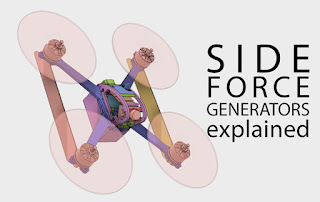 These manoeuvres will be repeated several times to get statistically significant results, and the setup of the left/right propellers will be switched to account for any asymmetries of CG, ESC or motor performance. After the flights, the blackbox logs will be analysed (in my case with Matlab and some custom, automated code). The mean throttle that was applied by the flight controller to each individual motor will be calculated for each manoeuvre. Analysis, example for the full throttle horizontal flight manoeuvre. Let's assume that the two motors on the left side (with propeller type 'A') have to run at 97% throttle during this manoeuvre, while the two motors on the right side (with propeller type 'B') only run at 78% throttle. That means that type 'B' propellers have the potential to generate more thrust (in fast forward flight) than 'A'. But the flight controller needed to slow them down by 19% to keep straight flight. 'B' can reach a higher top speed. When 'B' has lower average throttle than 'A' during the acceleration manoeuvre, that means that 'B' could potentially accelerate even faster, but the flight controller had to slow them down. 'B' have better acceleration. When 'B' has lower average throttle than 'A' during this manoeuvre, then that means that the braking force of 'B' is worse than that of 'A'. I am using Matlab for batch processing all Blackbox data. 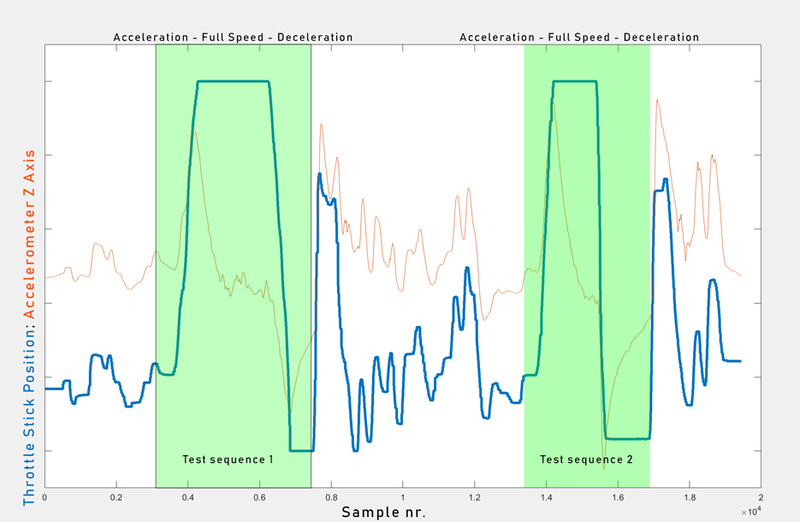 Two test sequences (green) in a Blackbox log, each consisting of acceleration, full speed and deceleration. 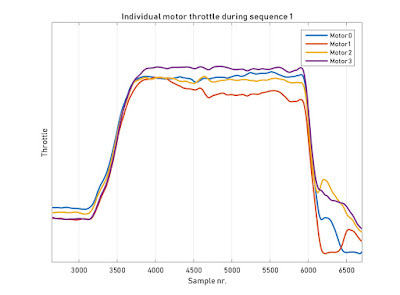 The graph shows the pilot throttle stick position and the acceleration vertical to the propeller disk. 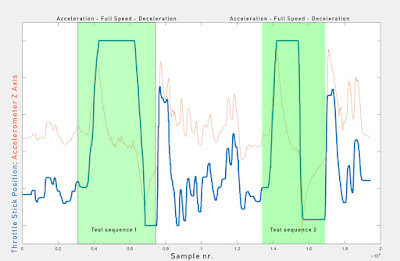 At least 6 sequences are analysed for each propeller comparison. 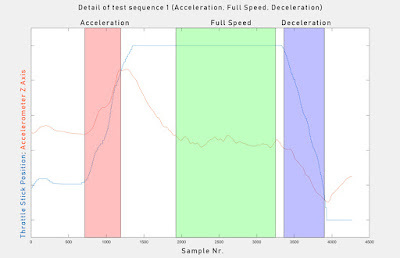 Magnification of sequence 1, showing more detail of the three manoeuvres acceleration (red), full speed (green) and deceleration (blue). Acceleration is defined as the time span where throttle stick and Z acceleration are rising. Full speed is the time where throttle stick is maximum and Z acceleration is constant. Deceleration is when throttle stick and Z acceleration are decreasing. 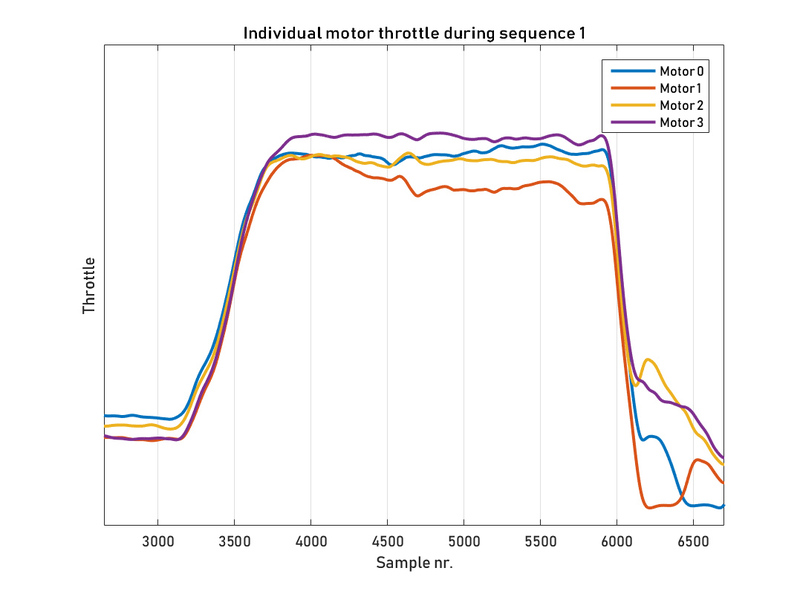 This graph shows the individual motor throttle that is applied to each motor as an end result of the PID loop in Betaflight. It is used to calculate mean values of the left and right motor pairs for the different manoeuvres. This method can't tell you anything about the efficiency of the propellers. Efficiency is propertional to thrust times velocity, divided by PWM duty cycle (= throttle) times Lipo voltage times current draw. My method does not measure current draw. So I can't say anything about efficiency. Only brute force is what I capture. It also can't tell you whether your motors, Escs and lipo battery are running within their specifications with the propellers under test. This, and also efficiency, is something you have to determine with existing, traditional tests. 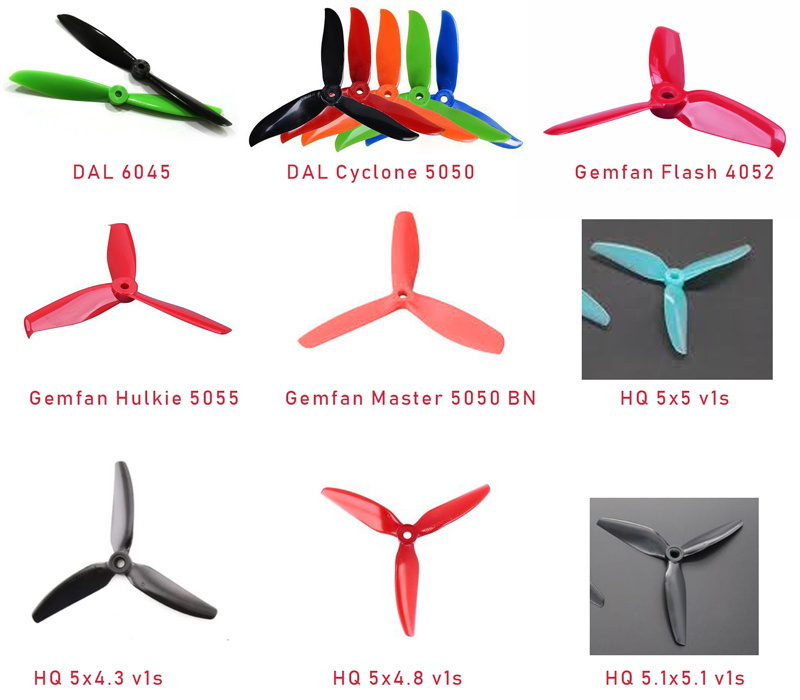 Measuring and comparing efficiency of different propellers could be added relatively easily by using ESC current telemetry. Sponsors for suitable ESCs are welcome! I tested 9 different propeller types. Thanks to Heiko Schenk for supplying the HQ propellers! The propellers that I tested in flight. I was testing a small selection of my favourite 5" propellers for 22XX 2300 kV motors. I also added 4 inch and 6 inch props, just to verify that my expectations do match my measurements. Full Speed performance. LOWER values represent HIGHER full speed. 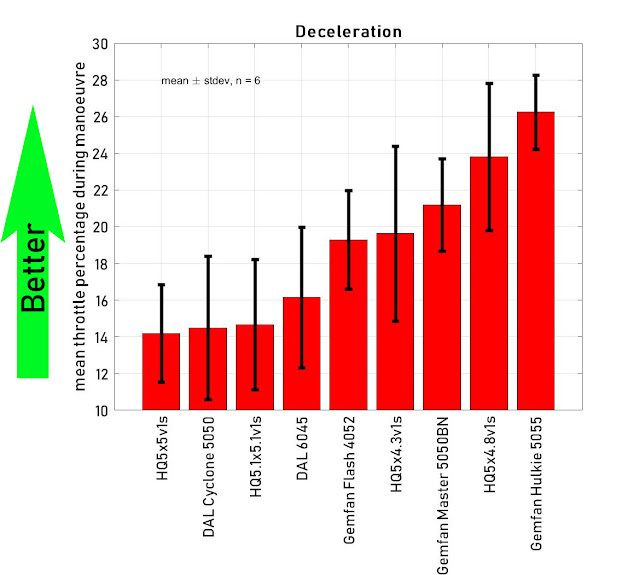 Deceleration performance. HIGHER values represent BETTER deceleration. The results are pretty nice and I can now decide more easily which propellers to use for which track. 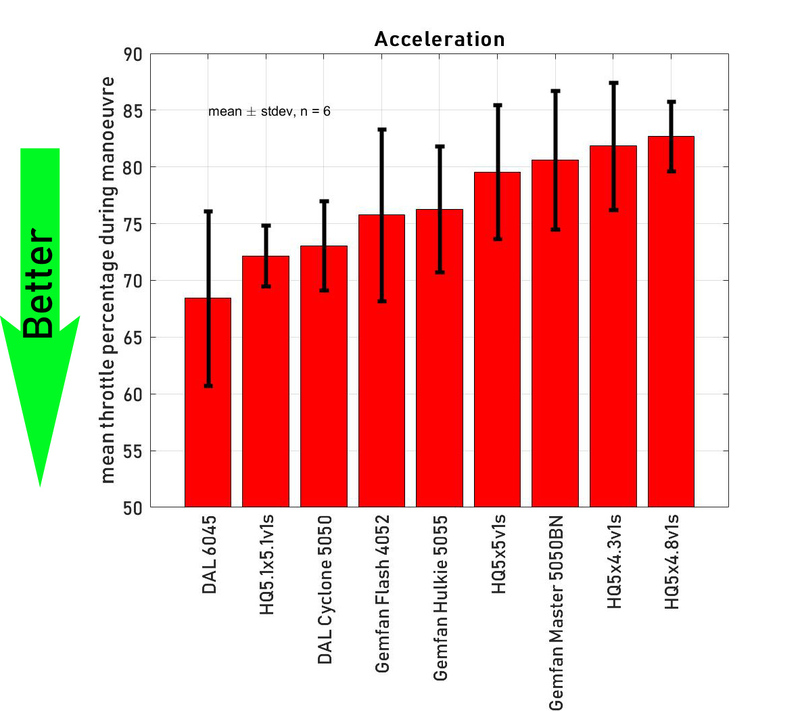 However, the standard deviation of acceleration and deceleration are really high, indicating a lot of noise in the data (which makes also sense). These results have to be 'consumed with caution'. HQ 5.1x5.1 have a very good acceleration and top speed, but the deceleration is bad. So for intermediate pilots like me, it will be more difficult to fly. I would choose HQ 5.1x5.1 for fast tracks, and Gemfan Hulkie 5055 for more technical tracks (due to the good deceleration performance). Can I apply these results to my 2700 kV setup? These relative results are probably valid for all RPM, they are not limited to a small range. But you have to keep in mind that your 2700 kV setup will most likely be overloaded by high-pitch or high diameter propellers. Let's put it this way: The HQ 5.1x5.1 v1s would be the fastest propeller on a 2700 kV setup if it does not burn or overload the motor or deplete the battery before you finished your flight. You've created a brilliant test for measuring in-flight propulsion. I am all about measuring speeds of the technology I use on a daily basis, looking for the best of the best to keep up with my busy life. I have even invested in an Airwheel electric unicycle to get me from place to place quickly during the work day. I would love to develop detailed charts like yours, measuring how much time I am saving by using my transportation device! 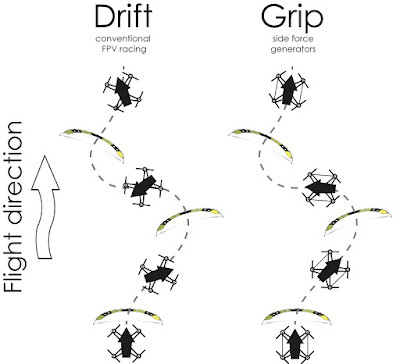 Drone athletics may be a well-known sport wherever individuals fly around their Racing Drones and race as quick as they'll. Most drones have FPV systems lately, that is that the person read. There square measure cameras within the athletics drones, that give them the texture of flying as if they were within the cockpit. 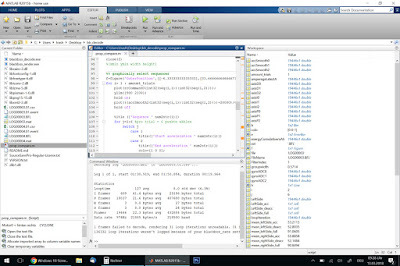 Would you be able to provide the Matlab program in the form of an executable? 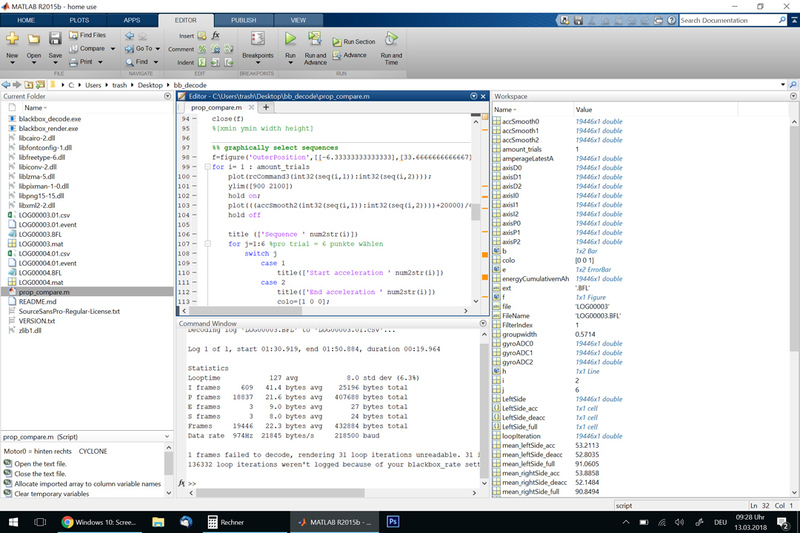 So those of us without a Matlab license can still run it.